Bruno is a good Marksman character with great damage output. Use him for either Minion mobs or hero damage. 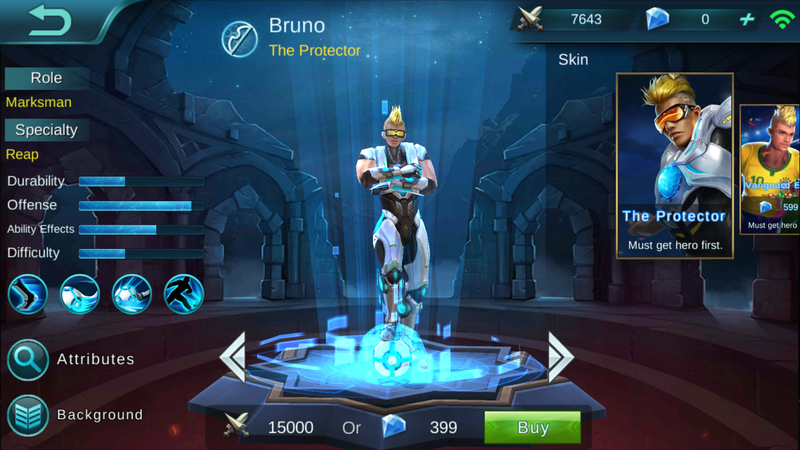 Description: Each time a skill causes damage, Bruno’s nechanical legs will add a 4% crit strike chance effect, stacking up to 5 times. Description: Kicks a shot-refracting energy ball at a specified target, dealing 230 pts of physical damage and slowing down the target 55%. 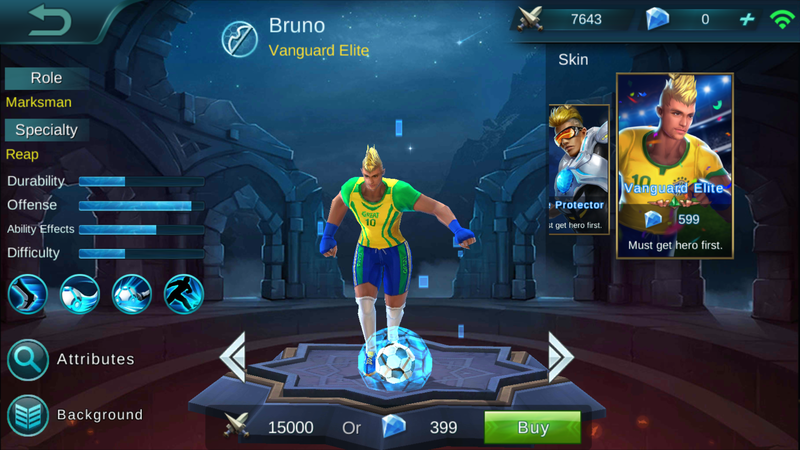 Bruno and teammates can pick up the energy ball to reduce this skill’s cooldown. Description: Bruno makes a forward slide tacle, stunning enemy units and dealing 140 pts of physical damage. Description: Kicks an energy ball filled with energy at a specified hero. dealing 250 pts of physical damage and knocking the target back. 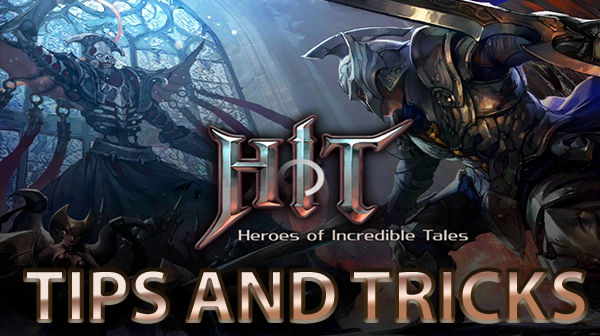 The energy ball will then ricochet among enemy heroes until it cannot find a new target. Born in the slums, Bruno was always more frail than other children his age, but this did not prevent him from having a heart that yearned for freedom. One day in a terrible incident, Bruno lost both of his legs trying to save a friend, causing him to pretty much give up on life. The scholars of Eruditio however heard his story, and out of pity for his misfortune and admiration for his bravery, they decided to use the city’s most advanced technology to make a new pair of legs for him. When Bruno was finally able to stand on two legs again, he was surprised to discover that his mechanical legs allowed him to run like the wind. To express his gratitude, Bruno vowed to always protect the City of Scholars to his dying breath. Eruditio in turn made an energy ball weapon that works with his mechanical legs, and from that day, anyone who tried to cross the citizens of Eruditio were met with Bruno’s merciless attacks. 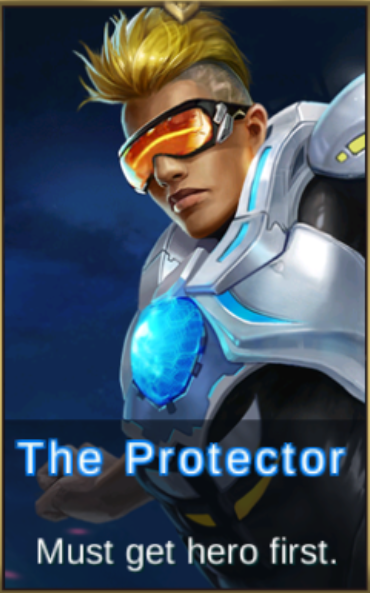 The people simply call him The Protector.